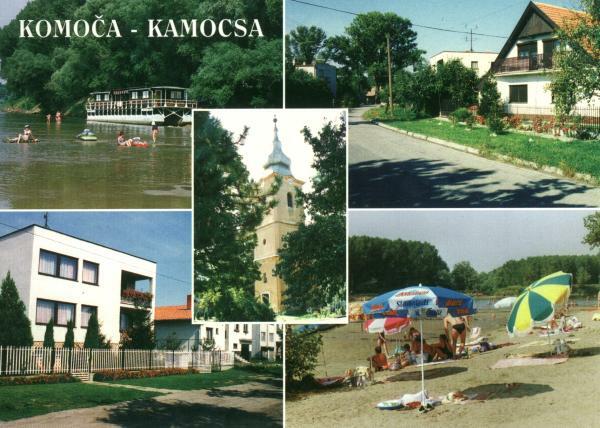 Village Komoča and its terrier is spread on the left bank of the Váh river, near the confluence of the Nitra tributary and 3,5km before joining the Váh and the Malý Dunaj. Terrier of the village Komoča has character of the typical Podunajská lowland with richness of underground waters, fresh green and river floodplain forest. Terrier of the village with its area of 1530ha is a plain with an average absolute altitude 110m. Village of present-day had been developed from a fishing village. The first written mentions originate from the years 794-820 AD. It had been a settlement of a moveable character caused by flood of the Váh. In the X. th century the settlement had been stabilized. Data about foundation of the village we do not have specified. Nowadays there live 920 inhabitants, 91% of Magyar and 9% of Slovak nationality. Near the Váh river there is a recreational area, 75 private cottages and a public camping site with social facilities. Water and "hot" sand stretching on several hectares are very suitable and popular for spending many enjoyable moments. A good availability of the village is ensured by state roads from Nové Zámky (12km) and from Kolárovo (5km). - a recreational area of approximately 9ha.